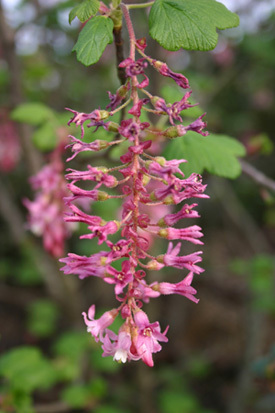 This native currant (Ribes) is among the California native plants that will be available at the Arboretum's Spring Plant Sale. Photo by S. McCabe. The UC Santa Cruz Arboretum will hold its annual Spring Plant Sale on Saturday, April 16, at the Arboretum's Eucalyptus Grove on High Street near the intersection with Western Drive. Held in conjunction with the California Native Plant Society (CNPS), the event coincides with the start of California Native Plant Week. Both sales are open early (from 10 a.m. to noon) to members of the Arboretum Associates and CNPS, and to the general public from noon to 4 p.m. Both the Arboretum and the CNPS will have a flowery mix of native plants for sale. Most of the natives are drought tolerant, but some of the CNPS offerings are canyon or riparian plants that can use some supplemental water in summer. As usual, the Arboretum will be offering a range of unusual exotics, including some new ones. The Arboretum's non-native plants are screened to be noninvasive. The two sales present a colorful display of options to spice up your garden for spring. Arboretum director Brett Hall will give a talk on "Native Plants for the Garden" at noon at the site of the sale in the Eucalyptus Grove. Two other events in the week leading up to the sale will also focus on native plants. On Sunday, April 10, Rick Flores, curator of the Arboretum's California Native Plant Collections, will lead a tour of the native plant garden near the front entrance of the Arboretum. Meet at 11 a.m. at Norrie's Gift Shop for the tour, which is free with regular admission. On Tuesday, April 12, author Carol Bornstein will discuss her new book, Reimagining the California Lawn, and sign copies in the Horticulture Building. The event is free (no admission charged) and starts at 7 p.m.
May 9, 7:30 p.m. "A Californian's Guide to Trees Among Us," with Cal Poly associate professor Matt Ritter. Free talk and book signing. Jointly sponsored by the Arboretum and California Native Plant Society. At the Horticulture Building. May 17, 7 p.m. (6 p.m. potluck). "UCSC Arboretum Native Plant Program: Highlights from the Central Coast." Arboretum director Brett Hall will discuss the Arboretum Native Plant Program and illustrate current fieldwork, collections from the central coast, the native plant introduction program, and the purposes of the conservation and display gardens. Free event. For more information, contact the UCSC Arboretum at (831) 427-2998 or visit arboretum.ucsc.edu. The Arboretum is open from 9 a.m. to 5 p.m. every day. Norrie's Gifts is open daily from 10 a.m. to 4 p.m.